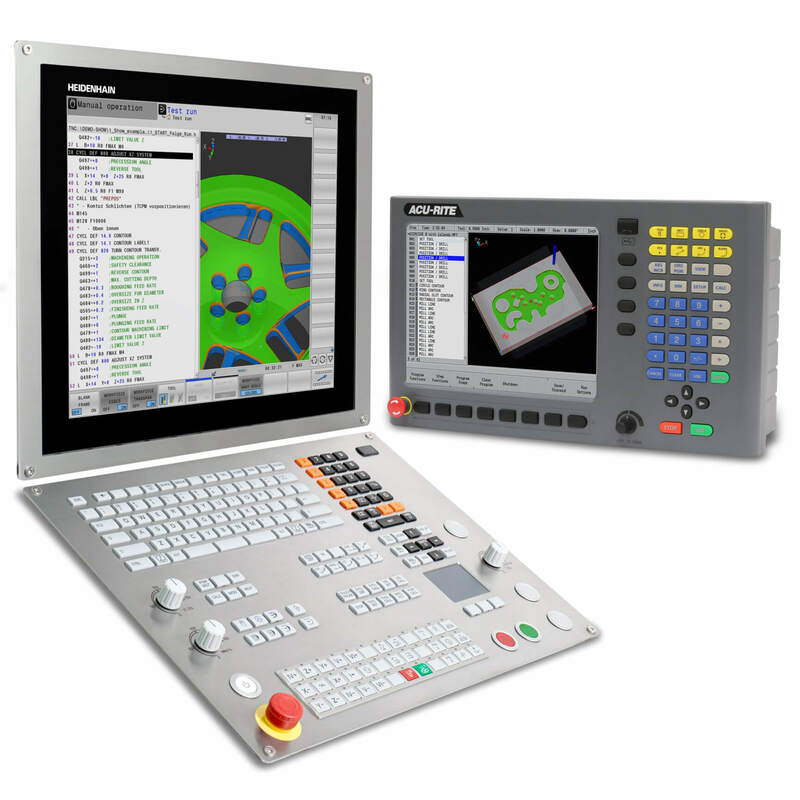 Productivity and accuracy are important attributes in the competition for machine tools. Five-axis machining provides considerable potential for increasing productivity. In many cases it permits higher metal removal rates than 3-axis machining. Production times can be significantly shortened thanks to a reduction of time required for resetting, for example, or through multi-operation machining in one setup. In any case, with increasingly complex workpiece geometry, 5-axis machining is becoming an indispensable part of the machining process. Since significantly larger traverse ranges of linear axes are usually required for 5-axis machining, machines need to provide high accuracy over the entire working space. Moreover, the two rotary axes in a 5-axis machine tool can greatly influence attainable workpiece accuracy. Besides the rotary axes, in most cases the linear axes must also be moved in order to change the orientation of the cutter to the workpiece surface. This can cause visible flaws in the traverse range of up to five axes within a small area of the workpiece surface. In 5-axis machining, precision-limiting effects in the drives, such as screw-pitch and transmission error, reversal error or thermally induced displacement can therefore much more quickly lead to the production of scrap. The positioning accuracy of linear and rotary axes play a decisive role here in the performance of a 5-axis machine tool. By now, 5-axis machining has become indispensable in many areas of metal-cutting machining. Clear economic advantages result from the capability to machine workpieces completely in one setup: the door-to-door time of a part can be dramatically reduced. At the same time, part accuracy can be significantly increased. Beyond this, the additional rotary axes allow better access to complex workpiece contours, for example cavities in dies or molds. Often, they permit shorter tools with less inclination to chattering so that even higher metal removal rates are achieved. With 5-axis simultaneous machining, the cutting speed at the tool tooth can be held within narrow limits even on complex contours. This brings significant benefits with regard to the attainable surface quality. What is more, the use of highly productive tools (e.g. toroid cutters) when milling freeform contours would not be possible at all without 5-axis simultaneous machining. High strength and low weight are essential for the aeronautics and space industry. Integral construction has established itself as the way to minimize the weight of “airborne” parts: components with complex structure are manufactured completely from a single blank. Metal removal levels can be as high as 95 %. This high “buy-to-fly” rate leads to high costs for the raw material of the blanks. In the area of structural components, 5-axis machining opens new opportunities for reducing weight without loss of component strength. First, a computer-aided topology optimization is conducted that adapts the geometry of the component to the respective loads. The result: the material is brought specifically to where the mechanical load can be highest. In the other areas, material is specifically reduced. For example, the thickness of walls for stiffening can be easily adapted to the load distribution in the component. The wall thickness can decrease with increasing height, for example. This workpiece geometry can be realized in a simple way through 5-axis pocket milling. Five-axis machining has long become the standard for the machining of jet engines. High efficiency requirements are driving continuous improvements in the flow characteristics of all jet engine components. The resulting component geometries are very complex and are therefore manufactured exclusively in 5-axis simultaneous milling movements. Uncounted molds and dies are needed in automobile manufacturing for sheet metal and plastic processing. Dies for sheet metal forming can be up to 6 m long and need to be milled at the very high accuracy of ± 0.02 mm so that the upper and bottom dies can work together with the correct gap. Moreover, a very high surface quality of all functional surfaces is necessary in order to ensure that the forming tools have a long service life. When manufacturing the tool contour, the machine has to maintain a very small distance between cutting paths in order to fulfill the requirements for high surface quality. This automatically lengthens the run times of the NC programs. The required accuracy of the forming tools is a formidable challenge for machine tools: high accuracy during long program run times on large components necessitates high thermal stability of the machine structure and the feed drives. Five-axis machining opens new perspectives for shortening machining times because even deeply curved contours of forming tools become more easily accessible. In addition, special tools such as toroid or radius cutters can be used that permit significantly larger path spacing and therefore reduce program run times. In the field of medical technology, demand is high for devices that are adapted to special examinations or therapies. This can make treatments considerably more precise and reduce aftereffects on the patients. The devices are often characterized by very complex geometries that make 5-axis machining of single parts on milling machines attractive. Increasing life expectancy brings with it an increase in demand for tooth and joint implants. Today, hip and knee replacements offer many people the opportunity for a significantly better quality of life. In their external form, tooth and joint implants have to be perfectly fitted to the specific mating surfaces of a human body. Implants are mostly manufactured on milling machines, because milling makes even small batch sizes possible. Due to complex shaping of implants, medical technology is one of the largest fields of application for 5-axis machining. 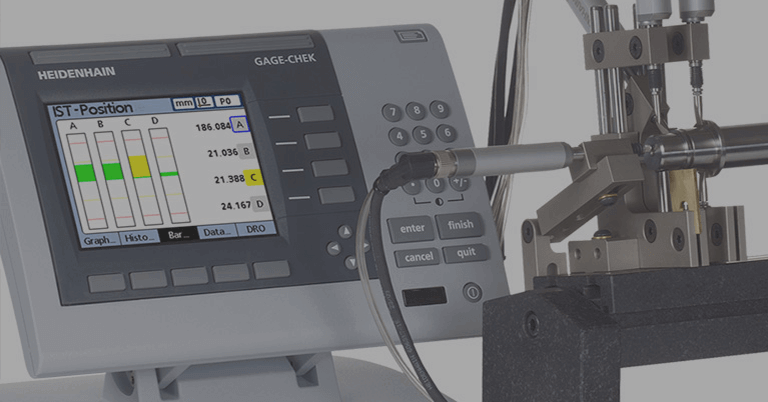 A prerequisite for the economical manufacturing of such sophisticated components is machines with high-accuracy position measurement for accurate and precise feed movements. In 3-axis milling, the feed axes move within the dimensions of the workpiece plus the tool diameter. Unlike with 3-axis machining, in 5-axis machining the inclination of the tool can be adjusted with respect to the workpiece surface. If the position of the tool center point (TCP) remains unchanged, a change in the cutter orientation usually requires additional movement in the linear axes. These compensating movements necessarily increase the traverse range required by the linear axes. Because increasing traverse range also means increased positioning error, feed axes of 5-axis machines need significantly higher accuracy and reproducibility. The compensating movements of the linear axes are superimposed on the movements of the tool center commanded by the NC program in X, Y and Z. Due to this superimposition, the axis feed rates for the tool center can significantly exceed the programmed feed rate. The increase in feed velocity results in increased heat generation in the motors, transmission and recirculating ball screw. Depending on the principle of position measurement, the generation of heat can cause significant position error. To prevent faulty workpieces, precise position measurement in the feed axes directly at the moving machine elements is imperative. The position of a feed axis can be measured either through the recirculating ball screw in combination with a rotary encoder, or through a linear encoder. If the axis position is determined from the pitch of the feed screw and a rotary encoder (Figure 1), then the ball screw must perform two tasks: As the drive system, it must transfer large forces, but as the measuring device it is expected to provide a highly accurate screw pitch. However, the position control loop only includes the rotary encoder. Because changes in the driving mechanics due to wear or temperature cannot be compensated in this way, this is called operating in a semi-closed loop. Positioning errors of the drives become unavoidable and can have a considerable influence on the quality of workpieces. If a linear encoder is used for measurement of the slide position (Figure 2), the position control loop includes the complete feed mechanics. This is referred to as closed-loop operation. Play and inaccuracies in the transfer elements of the machine have no influence on position measurement. This means that the accuracy of the measurement depends almost solely on the precision and location of the linear encoder. Various conditions of application together with growing feed rates and forces lead to constant changes in the ball screw’s thermal condition. Local temperature zones develop on a recirculating ball screw, which change with every change in position and decisively reduce accuracy in the semi-closed loop. High reproducibility and accuracy over the entire traverse range of linear axes can therefore be achieved only through operation in a closed loop. The results are precise workpieces and a drastically reduced rejection rate. As an alternative to using a recirculating ball screw, linear feed axes can also be driven by linear motors. In this case, the position of the machine axis is also measured directly by a linear encoder mounted on the axis slide. For highly dynamic and at the same time quiet operation, linear motors already depend on high-resolution, accurate linear encoders. For this type of drive, the advantages of closed-loop operation apply unrestrictedly. The basic principle for linear axes also applies to rotary axes. Here, too, the position can be measured with a rotary encoder on the motor, or with a high-accuracy angle encoder on the machine axis. If the axis position is measured using a rotary encoder on the feed motor it, too, is referred to as a semi-closed loop, because the transmission error of the gear mechanisms cannot be compensated through a closed position loop. friction and elastic deformations in the tooth contacts and the bearings of the transmission shafts. Beyond this, most pre-stressed transmissions are subject to significant friction that heats the rotary axes and can therefore—depending on the mechanical design—result in positioning error. In a semi-closed loop, the error in the transmission of rotary axes leads to substantial positioning error and to significantly reduced repeatability. The errors of the rotary axes are transferred to the geometry of the workpiece, which can greatly increase the number of rejected parts. The positioning accuracy and repeatability of rotary axes can be decidedly improved with the use of precise angle encoders. Since the axis positions are no longer measured on the motor, but rather directly on the rotary axes of the machine, this is referred to as closed-loop operation. Errors of rotary axis transmissions have no influence here on positioning accuracy. The accuracy with which a rotary axis can move to a certain axis position over a long period is also decidedly increased. Economic manufacturing with minimal scrap is the result. The rotary axes that are driven directly by a torque motor play a special role. The torque motors’ special design permits very high torque without additional mechanical transmission. Rotary axes with torque motors require a high-resolution angle encoder immediately on the machine axis. They are always operated in a closed loop. Semi-closed loop: Position measurement by rotary encoder on the feed motor. Errors of the drive mechanism are not recognized. Closed loop: Position measurement by an angle encoder on the machine axis. Errors of the drive mechanism are compensated. Torque motor: Rotary axes with torque motors are operated in a closed loop. The soccer ball for the FIFA World Championships of 1970 and 1974 were named after the Telstar, the first non-military communication satellite, which was launched into space by the NASA and AT&T in 1963. The Telstar ball bears over 20 white hexagonally and 12 black pentagonal pieces that were sewn together. This ball serves as the model for a workpiece that can be milled on a 5-axis machine tool. The resulting workpiece is being used as a test piece to prove machining accuracy with 5-axis milling. A perfect optical appearance of the Telstar workpiece is possible only if the “seams” between the pentagons and hexagons are milled with consistently superb precision despite a machining time of over two hours. At the intersections, exactly three seams meet that are milled with various cutter inclinations. An intersection can therefore be machined precisely only if the cutter’s tool center point (TCP) is positioned with three differing inclinations at exactly the same point. However, the three inclination angles of the cutter require large compensation movements in the linear axes. For each seam, a much different position of the linear and rotary axes results at the TCP position of an intersection. Semi-closed loop: influences of the drive mechanics impair machining accuracy. The seam width varies. The seam intersections are visibly inaccurate. 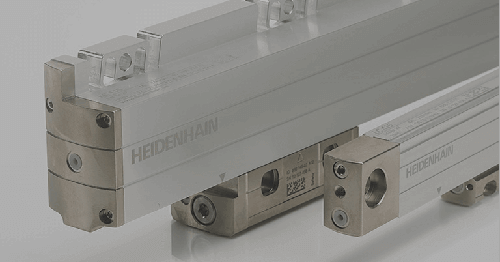 Closed loop: Thanks to the precise linear and angle encoders from HEIDENHAIN, errors in the drive mechanics have no influence on the result of machining. The seams are milled to the correct width, and the intersections all match up exactly. During milling, positioning errors in one or more feed axes inevitably prevent the TCP positions from coinciding when milling the three seams at their intersection. High accuracy in the positioning of all feed drives is indispensable for precise machining of the seams, including the intersections. For a simple visual evaluation of the Telstar workpiece’s accuracy, a 0.15 mm deep seam is manufactured throughout with a 25 mm diameter cutter. This results in a very flat seam cross-section, so that even the smallest error in the seam’s depth (±10 μm and less) causes clear fluctuations of the seam width. If the Telstar workpiece is manufactured on a machine in asemi-closed loop, the positioning accuracy and repeatability is limited by the transmission error of the recirculating ball-screw in the linear axes and the transmission in the rotary axes. The result: the seam width fluctuates on the Telstar workpiece. The intersections cannot coincide exactly with each seam, so that a clear displacement of the seams’ centers results. In a closed loop, the feed axes attain very high positioning accuracy and repeatability over the entire traverse range. This makes precise machining of neighboring sections on the workpiece possible, even with large changes to the cutter orientation and substantial periods between the individual machining steps. The attainable precision is visible in the intersections of the seam paths. Each intersection is approached in all three neighboring seams. In addition, the seam width remains constant over the entire circumference of the Telstar workpiece. Five-axis machining provides considerable potential for reducing machining times. The lateral surface of a polygonal workpiece is finished simultaneously with a plain milling cutter in 5-axes in one revolution of the workpiece. Compared with 3-axis machining of the lateral surface with a ball-nose cutter, 5-axis machining reduces machining time to 30 %. Precise machining with five simultaneously moving feed axes place stringent requirements on the accuracy of the feed drives. 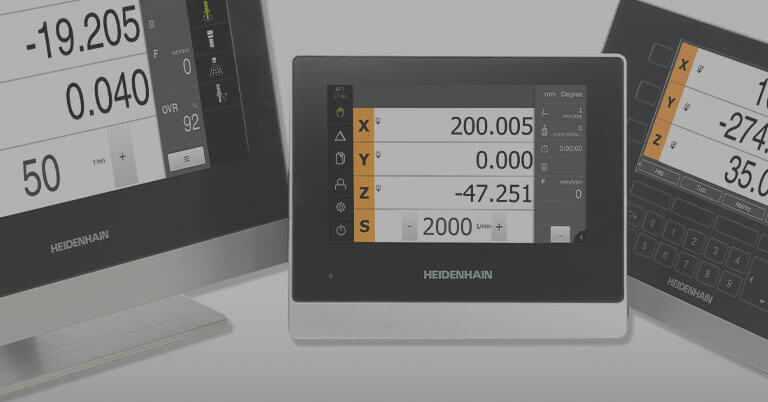 Depending on the type of position measurement, the errors of the additionally required rotary and tilting axes can cause significant limitations on workpiece quality. 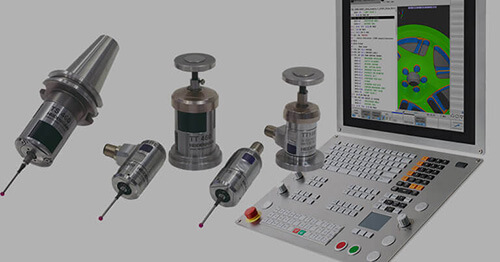 It is therefore essential to pay special attention to the correct encoder and its integration into the control loop. The periphery of the polygonal workpiece is machined in one revolution of the C axis with simultaneously interpolated movement of the B axis. During machining of the lateral surface, the B axis is tilted in and out five times in a tilting range between 1° and 19°. To examine the effect of position measurement on the result of machining, workpieces were machined with the B axis separately in a closed loop and in a semi-closed loop. All other axes were in a permanent closed loop. In a semi-closed loop, mechanical errors of rotary axes can cause position errors and therefore result in inaccuracy. Tilting axes often have drives with multiple-stage gearing. For uniform motion in a tilting axis, all gear components must have high manufacturing accuracy and be assembled precisely. Even small eccentricity errors of the gear can cause distinct fluctuations in the speed of the tilting axis. Illustrations 3 and 4 show the effect of eccentricity in a gear stage. The transmission with precisely assembled gears transfers the motion of the drive motor without error to the tilting axis. If a transmission gear wheel is eccentric, the movement of the tilting axis has a sinusoidal error. The illustrated polygonal workpiece was manufactured on a milling machine whose tilting axis has a transmission reduction of i = 120. The motor pinion has a diameter of 40 mm. The radial runout of the pinion is ± 0.058 mm. If the tilting axis is controlled in a semi-closed loop, the sinusoidal position error generated by the transmission cannot be detected by the drive controller. One revolution of the drive motor with eccentric pinion causes motion errors of the tilting axis in the range of ± 10 angular seconds. The error repeats itself every 3° with respect to the tilting angle. In a first experiment, the polygonal workpiece is machined in the semi-closed loop. The position errors generated by the transmission are clearly visible as surface ripple on the lateral surface of the polygonal workpiece. The resulting form deviation is ± 0.015 mm. The transmission error is visible only on the sections of the workpiece at which the tilting axis moves. In a second experiment, the tilting axis was controlled in a closed loop. 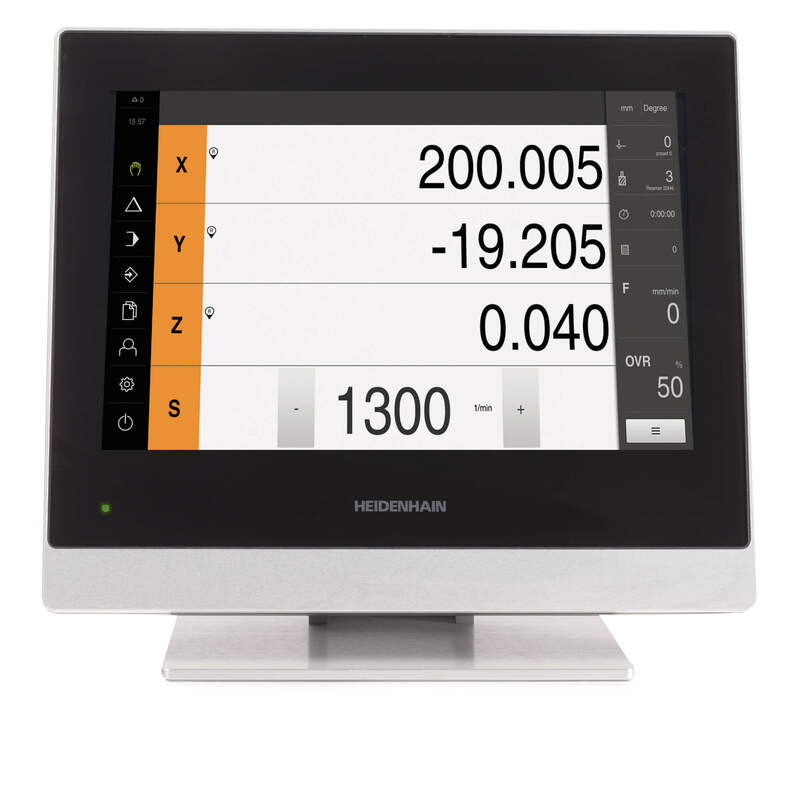 Here a HEIDENHAIN angle encoder with optical scanning was employed. The angle encoder measures the axis position directly at the tilting axis. In this way the effect of the transmission error from the gears is immediately detected. The drive controller reacts immediately to very small deviations and generates the equivalent countermovement of the feed motor. The transmission errors therefore have no effect on the result of machining. 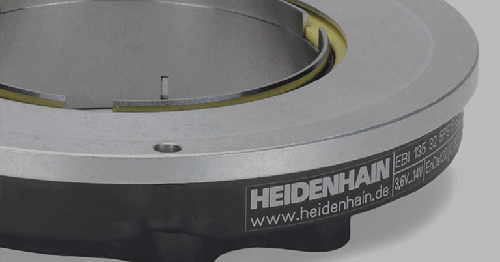 Thanks to the HEIDENHAIN angle encoders on the rotary axes, the lateral surface can be milled in 5-axes simultaneously with short machining time and, at the same time, high surface quality and accuracy. The sides of prismatic components are often machined in opposite orientations. In this case, one side is machined first—perhaps by using a tilting axis to incline the workpiece with respect to the tool. The workpiece is then turned 180° by a rotary table to machine the opposite side. Machining in opposite orientations places stringent demands on the positioning accuracy of the rotary table. Even small angular errors in the turnabout movement result in errors in the parallelism of opposite sides of the workpiece. On a workpiece with a 500 mm edge length clamped at the center of a rotary table, a positioning error of only two millidegrees results in an error of 0.01 mm perpendicular to the surface. Positioning errors can occur on rotary axes when the machining position is measured at the shaft of the drive motor (semi-closed loop), because the errors in the rotary axis transmission (play, elasticity, radial runout of the gear shaft) cannot be included in the position control and are not compensated. Depending on the design of the drive mechanics, semi-closed loop control can result in positioning error in the turnabout movement of ± 10 millidegrees and more. The accuracy of a rotary table can be dramatically improved by using precise angle encoders that measure worktable movements directly. 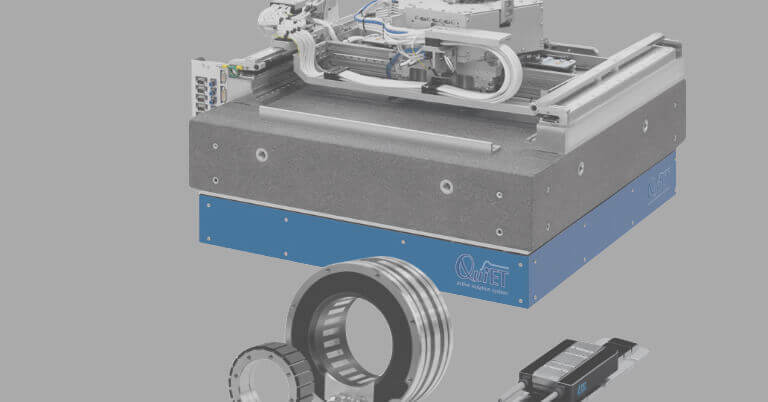 The transmission error in the gears of rotary tables are ascertained by the angle encoder and therefore compensated in the position control (closed loop). In closed loop operation, the precision of the angle encoder largely decides the accuracy of the turnabout movement. Angle encoders with optical scanning can make values of less than 0.3 millidegree possible. To illustrate the influence of positioning accuracy in rotary tables on machining in opposite orientations, a text was carved out of the sides of a cuboid component. First the component is probed on a 5-axis milling machine on one of the workpiece sides in the tilted plane. Then a text is cut out with a ball-nose cutter and 3-axis interpolated climb milling and up-cut milling. The characters have a height of 0.025 mm. Then the component is turned around on the rotary table by 180° in order to carve out a second text with the same character height on the opposite side. First a workpiece is milled in a closed loop (see ☑ on the workpiece). Then, a second workpiece is machined on the same machine in a semi-closed loop (see ☐ on the workpiece). The difference becomes apparent very soon. While the texts milled in closed-loop control with precise linear and angle encoders were machined without error on both sides, in the semi-closed loop, machining errors are recognizable: on the back of the component milled in a semi-closed loop the engraving is deeper at left while at right the tool is simply cutting air. Position-dependent and direction-dependent positioning errors in the semi-closed loop cause a slant in the machine table and workpiece. This results in a plainly flawed engraving and the rejection of the workpiece. Five-axis machining places particularly demanding requirements on the accuracy of feed drives because the traverse ranges and axis feed rate grow in comparison with 3-axis machining. The generation of heat and mechanical transmission error in the feed drives turn position measurement of the feed drives into a decisive factor for machining precision. Scrap and costs are minimized with the correct position acquisition. Therefore, linear encoders for linear axes as well as angle encoders for rotary and tilting axes are indispensable for machine tools on which high positioning accuracy and a high machining speed are essential.